Your bedroom is more than just a place to sleep. With increasingly common fast-paced lives, it is important to have a space to unwind. Bedrooms should have a vibe that reflects your personality and instantly lets you relax and recharge as you escape everyday life. 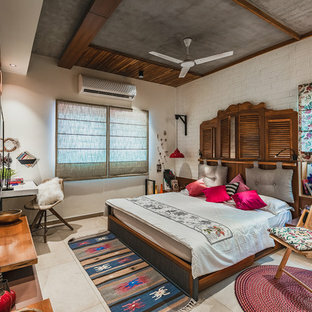 You can set the tone of your bedroom by making tiny decor tweaks or by planning a complete overhaul of the bedroom design. Start thinking about the bedroom of your dreams right here by browsing these bedroom ideas. 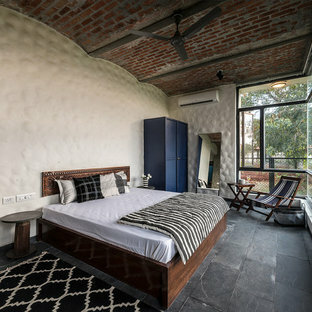 How do I start the bedroom design process? Bedrooms are extremely personal, so start by defining your style. Do not get hung up on popular bedroom trends. If you have the luxury of planning a new bedroom design from scratch, avoid creating a layout that lets you look directly into the master bedroom from a shared space, such as the living room or kitchen. 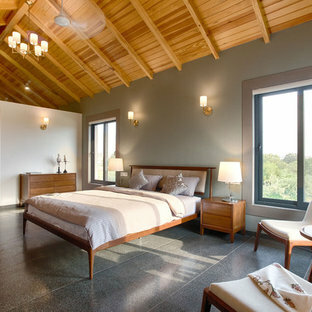 Also, it’s always nice waking up to a view, so pick bedroom ideas that focus on a vista, rather than the bed itself. The bed is the focal point so decide the size and style carefully. Remember, style is important when selecting the frame but comfort is key for the mattress. How do I determine my bedroom layout? 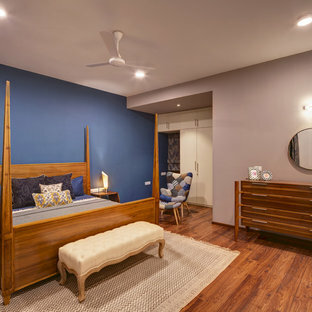 The placement of the bed and other larger pieces of bedroom furniture, like the chest of drawers, night stand and almirahs will help in determining the layout of the master bedroom. Start by picking a bed spot; ensure it isn’t underneath a window or next to a door, even the smallest crack can stream in light as you try to fall asleep. 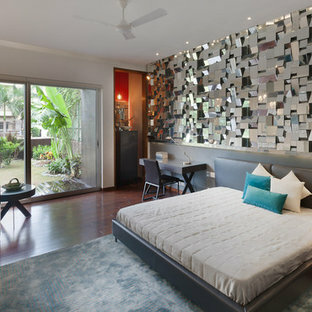 Build out the rest of the bedroom design by arranging the other elements based on ease of use. Also, remember that good bedroom layouts must provide plenty of walking space and enough room for drawers and cabinets to open properly. How do I select colour schemes and bedroom decor? Colours are mood enhancers, so the right bedroom colour schemes can improve the quality of your sleep. 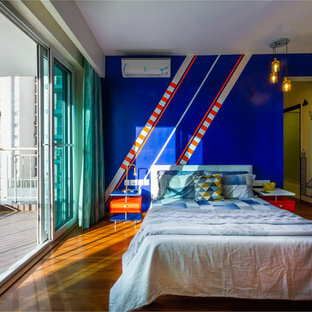 Green and blue schemes are excellent choices for bedroom interiors. Green possesses healing quality while blue has a soothing effect. White is a popular choice as it reduces stress and also has a neutral effect giving more room to colourful decor elements. 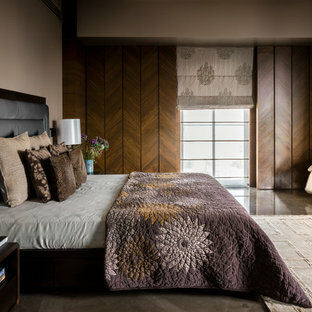 If your master suite is large try to play with dark tones to create a warmer look. When it comes to bedroom decor ideas, your options are endless. It’s helpful to start by tackling the more permanent things, like wall decor. Create a feature wall – paint it with one vibrant colour, select a wall sticker or pick out some bright bedroom wallpaper. Add splashes of colour through bedding and accessories – lampshades, rugs, pillows and throws for understated elegance, or try black and yellow for a scheme that is a little more daring. For a truly dreamy effect, try soft, smoky blues with white linen and a dash of light grey. What is the best way to design and decorate a cosy bedroom? 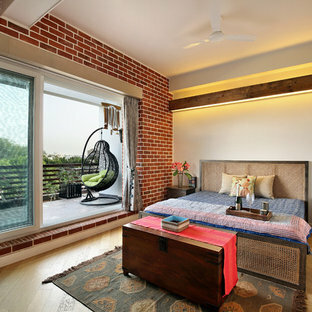 Clutter is the biggest enemy of cosy bedroom designs. So opt for bedroom layouts with lots of storage ideas like a high bed with lots of room for boxes and rolling under-bed space. Wall-mounted shelves and fitted wardrobes on either side of the bed are perfect as they can create much-needed space for hanging clothes whilst creating a cosy nook to sleep in. As far as bedroom colour schemes are concerned use neutral or pale and simple colours to create the feeling of extra space. Ensure your bedroom furniture choices are multi-purpose for example, a dressing table can double as a workspace and a dressing stool with a lift-up lid offers hidden storage. Add patterns and textures to complete the look of the space with bedding linen. Sumptuous bed linen is one of life’s great luxuries, so cocoon yourself in quality fabrics. Look through all the bedroom photos, from grand to small bedroom designs and save the ones that inspire you most. Don't forget to save your favourite bedroom photos, ideas, colours, and layouts. By Atom Interiors . Smart Interiors.